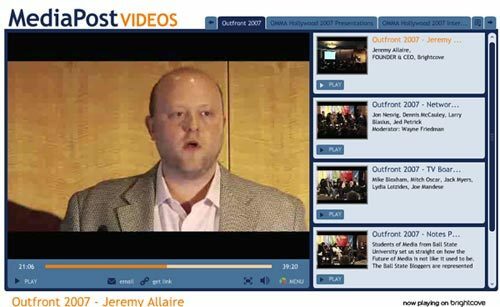 "Reach consumers where they are, not where you want them to be," said Allaire, during a keynote address at Media magazine's Outfront conference in New York. It's a "fragment or be fragmented" world and traditional media players are catching on--whether it's Scripps, with its announced plans for 30 channels or MTV Digital, with plans for 300. Open distribution and "self-service models" where content can be created and distributed with no cost of entry are leading to an explosion of new programming outlets and niche networks because anyone can create a TV network today--production companies, publishers, or consumers. Allaire pointed to examples such as Better Homes & Garden's Better.tv, the broadband channel of Hachette's Elle.com, and the video channel of WSJ.com. The idea, says Allaire, should be some "blended distribution strategy" that includes a branded content site, strategic syndication to affiliate sites, and viral distribution through widgets or players such as Brightcove's that "empower the consumer to distribute it for you." For advertisers, you're looking at extending reach by 50%, 60%, 70% or 80%, he said. You can watch the entire keynote on MediaPost's Brightcove video player.